Kin Types exhumes the women who have died long ago to give life to them, if only for a few moments. 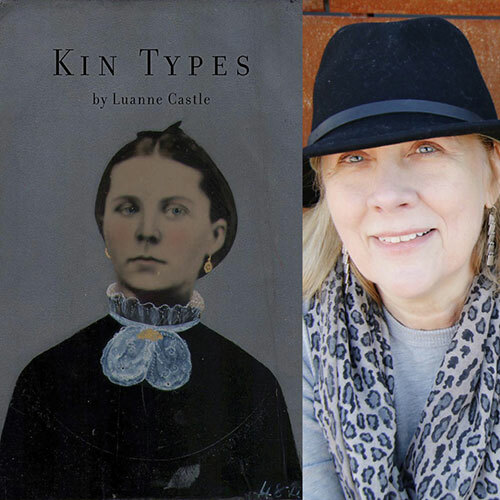 Through genealogical and historical research, Luanne Castle has re-discovered the women who came before her. Using an imaginative lens, she allows them to tell their stories through lyric poems, prose poems, and flash nonfiction. Winner of the 2015 New Mexico-Arizona Book Award, Doll God, Luanne Castle’s first collection of poetry, was published by Aldrich Press. Luanne’s poetry and prose have appeared in Grist, Copper Nickel, River Teeth, Glass: A Journal of Poetry, Barnstorm Journal, Six Hens, Lunch Ticket, The Review Review, and many other journals. Luanne has studied English and creative writing at the University of California, Riverside; Western Michigan University; and Stanford University. She divides her time between California and Arizona.